A cold day. Will seems very foolish today. I walked down to Pinkerton this forenoon and Will & I drove over to A.C. McKee's after dinner. Then Will & Ern drove to a wood bee at Wm. Flett's. Fan went to Geordie's this afternoon. I went down to Geordie's this evening. It was about. ten o'clock when I got. home. A nice day. We are very busy today. House-cleaning is the order of the day, beating carpets and etc. I was over at J. McKee's for a few minutes. I walked home this afternoon. Fan has got back to her post again. Ern took me to a party at Flett's tonight. All the boys at the wood bee brought girls to the party. We had an excellent time. A rainy day. I feel very tough today. I got a cold at the party. Mother went to the W. F. M. S. meeting. A rainy day. Lila came home from Metcalfe's today. Geordie Sawyer came over tonight and took Jack home. I walked down to Pinkerton after tea. When I came home Wilson Metcalfe & Will were at our place. They went to Cargill. Mr. & Mrs. J. D. Wilson were at our place tonight. Mr. Wilson & I played euchre against Father & Lila. We beat them by four games. A vey cold and windy day. Mother & I drove to Cargill in the afternoon. We had a very cold drive. Myrtle Garland was at our place when we got home. She came as far as her place with us when we were going to Guild. Rheta McIntyre was out at Guild. She is visiting at Uncle Adam's these days. Johnny, Alma, Rheta, Lila & I all walked home together. A windy forenoon. Will, Lila & I drove to McKee's and Lila stayed in Fan's place and Will, Fan & I drove up to Metcalfe's. We went to Sunday School and Church. Will Stewart came down to Daunt's for Sunday. We came home after church. Willie came with us as far as his place. It rained when we were coming home so Fan went down to McKee's. I did not go to church tonight. We heard today that Jessie Cameron died yesterday with pneumonia. A cold snowy day. Will drove to Paisley this afternoon. Mother went as far as Geordie's with Will. I walked to Pinkerton this evening. A Jew called here this forenoon, Mr. Reilly also called. Wellie Caswell was here this evening. A cold snowy day. I am housekeeper today. Father & Will took a load of pigs to the Grove. There were five pigs. They weighed 880 lbs. @ $6.35. Alma Reid was up this afternoon for a while. A cold north wind with a little snow. I am keeping house today. I went to Uncle Adam's this afternoon and stayed for tea and I walked down to Pinkerton after tea. Lila walked over to Geordie's this evening. Ern, Will & Fan drove over here tonight. Ern got a new driver. Lila got a ride over from Geordie's with them. Ern & Will went to Pinkerton. Fan stayed at our place till they came back. A nice day. I am still housekeeper. Ern called here this evening for a few minutes. Geordie Sawyer and Jack came over tonight. They brought Mother home. A nice day. Alma Reid was over for a few minutes this morning. I was over to Uncle Adam's for a few minutes this morning. Mother went down to Uncle Adam's this afternoon. Ern Webb called for me tonight and took me to a presentation and dance at Mr. Ed Chamber's for Mr. & Mrs. Jack Bradley, who intend going to the west. They were presented with a parlor suite. I had an excellent time. It was half past four when I got home. A cold day. I slept this morning till ten o'clock. I walked to Pinkerton this afternoon. Will came over from McKee's tonight and hitched up and drove away some place. A cold day with a little snow. I walked to church this morning. Johnny Reid walked up with me from morning church. Fan came over from McKee's this afternoon. Uncle Tom came this afternoon and stayed for tea. Fan & I walked to night church. Ern Webb drove us home. He drove Fan over to McKee' s then he drove me home. A little warmer today. I was very sick all forenoon. I walked to Pinkerton in the afternoon. I met Carrie Purdy when I was going to Pinkerton and she came back with me. Lou came over this afternoon and Daunt came over this evening. He was in Pinkerton with a load of chop. He stayed for tea. A cold and very stormy day. Father drove me over to A. C. McKee's this afternoon and then Fan and him drove up to Metcalfe's. I am going to work at McKee's the rest of the week. A cold windy day. Mr. & Mrs. Sutherland and Olive came to McKee' s tonight. Archie McLennan came over from Pinkerton. Sandy McKee, Ern & Will came out from Brant and Fred & Vina came over. Wellie & Wilson were also there. We had a dance, waltzes, schottishes and scotch reels. We had a good time. A nice day. I was over at J. McKee's for a few minutes and then Vina & I came over to A.C.'s and stayed for a while in the evening. Wilson Metcalfe and I were talking after the rest were in bed. A nice day. I walked down to Geordie's this evening. A nice day, cold wind. Mrs. McKee went away this afternoon. The kids were simply wild and I used lots of strap. Fan & Mother called today when they were going to Geordie's. Choir practice was here tonight. The kids bawled from about half past eight till near twelve. I was getting pretty near mad. A lovely day. They all wentt to church except Ern, Wilson, kids and myself. Ern drove Fan & I home this afternoon. Fan had come up from Geordie's. Ern went to Jack Armstrong's. Ern called for me at a quarter past six and we drove to Cargill Methodist Church. We expected to hear the evangelists but they did not come. Kate and Wilson were also there, It was a grand night. A nice but windy day. Ern Webb called for me tonight at nine o'clock and we drove to a party at J. McKee' s. I had a fair time . Ern Webb drove me home. A nice day. I got up this morning at half past eight, Alma, Carrie Purdy and myself called at the school for a few minutes to see the old school again. I had a sleep after dinner and then I walked over to Metcalfe' s. Lou has started housecleaning. A cool but nice day. We were busy all day. This is my birthday. I am seventeen. A trifle cold today. We were busy all day. A nice day. We were busy today. A beautiful day. Lou, Daunt & I walked to Sunday School and church. This is Sacrament Sunday. Lou & Daunt stayed in. Ern Webb called for me about six o'clock and we drove to Cargill Methodist Church. The Misses Halls, evangelists, were there. Ern & I had to go near the front of the church. It was a beautiful night. We drove down to the station to see the ruins. The station was burned last night. We drove around by Eden Grove and through Pinkerton. We went up home for a few minutes and then over to Metcalfe's. A rainy day, Daunt brought me home tonight in the cart. When I got home there was a letter from Alma and a souvenir pin. Fan came over from McKee's tonight and Fan & I walked down to Pinkerton and brought Tom Richardson's horse up and Fan took it over to McKee's. A rainy and cold day. Indeed we had a little snow. Fan drove over from McKee's this morning to go to Paisley but as it was raining we did not go. Father drove Fan back to McKee's and then took the horse down to Richardson's. The trees and fences are covered with sleet and look very pretty in the sunshine. Geordie was up this forenoon for a short time. Auntie & Uncle Adam drove up for Mother and took her to the W.F,M,S. meeting. Lila & I went to Pinkerton tonight. We got a ride with Wilson Metcalfe. It is a lovely night. A nice day. I house cleaned one room today. A lovely day. I walked down to Pinkerton this forenoon and got Tom Richardson's horse. Mother & I drove over to Geordie's and then Bess, Fan & I drove to Paisley and Mother minded the baby. Bess got a new hat. Fan & I ordered hats. I got a coat. I stayed at Geordie's all night. Geordie took the horse to Pinkerton. Harry Groves was over to Geordie's tonight. The dog bit him. The ground was covered with snow this morning. A nice day. I was working at Geordie's today. Bess was not very well. I walked over home tonight.. I was speaking to Fan. I was in at Uncle Adam's. Alma came over home with me. Ern & Melville were at our place. Alma went home with them. A nice day with a few sprinkles of rain in the afternoon. Lila, Ida & I walked down to Sunday School and Church. Lila & I got a ride home with Angus & Johnny Reid. I went over to Uncle Adam's with the boys. Fan came in for a while when she was coming home. Fan & I walked over home and then we walked to night church. We were too early and we went down to the river for a walk. Ern Webb said he would not be at church but he was there. Ern brought Fan & I home. He drove Fan over to McKee's then brought me home. We were not many minutes in the yard when Lou & Daunt drove in for me to go over with them. Ern drove me up to Metcalfe's then. A nice day. I am working at Lou's today. I was down to Stewart's this afternoon and stayed for tea. Mabel came up to Daunt's after tea and Willie came up later in the evening. Wilson Metcalfe drove me home tonight. A nice day. Mother & I are very busy housecleaning. Dave Elphick was sewing this forenoon on Sam's place. A nice day. We are busy housecleaning today. Alma Reid called for me to go to Pinkerton. When we were about to leave Fan came. She had Vina McKee's wheel. Fan left the wheel at our place and we walked down to Pinkerton. We had a good time. The ground is covered with snow this morning. Mother, Father & I drove to Paisley this morning. I got a summer hat. It was a very cold day. Lila & I walked down to Pinkerton tonight. We had a social night in our Guild, A large crowd was out. I ate lunch with Wes Burrell and Jean Cruikshanks. We had connundrums on a love story. We had tenty-three in all and we got eleven of them correct. However we did not get the prize. The highest nunber was thirteen. The prize was a lemon pie. Ern came from Brant tonight. He did not come into the church but he drove me home. It was after twelve when I got in. A cold day. Alma Reid called for me tonight and we walked down to Pinkerton and back again. A cold day. Lila, Ida & I walked down to Sunday School and Church. Fan came over from McKee's this morning. Fan & I went to N. Garlands this afternoon. Myrtle & Lily are sick. Fan & I walked down to night church. Ern Webb caught up to us coming home and gave us a ride, He drove Fan over to McKee's and then he & I drove up to Uncle Sam's gate for a drive. A very windy and smoky day. I walked down to Pinkerton this afternoon. We are very busy housecleaning. A windy day. Mother & Father drove down to Pinkerton this afternoon. They brought home a new churn. A cold day. Father drove over to Lou's this morning. We papered the kitchen today. Bess, Geordie & children came over after tea. Father drove Lou home tonight. A little warm. I went to Preparatory Services this morning. The service was conducted by Rev. Mr. Bridge (or Budge) of Hanover, I got a ride down and back again with Mr. & Mrs. Sutherland. Alma called for Lila & I tonight and we walked down to Guild. We went down for the mail and down to Deoplers for Alma's waist. Ern Webb was out from Brant tonight. He caught up to Alma, Lila & I on the road and gave us a ride home. He drove Alma home and then drove Lila & I home, Fan, Mother & Father went to Cargill this afternoon. A nice day. Ida went over to Geordie's this morning. Bill came home from Brant this evening. Lila went to Pinkerton this evening. A nice day but a very cold and windy evening. I walked down to Sunday School this morning. Father & Mother drove down to church. There was a large crowd out. 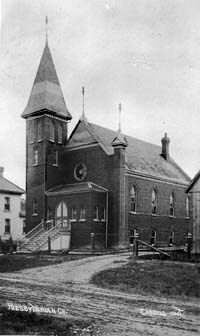 Nelson Flett fell while leaving the church. Fan & I got a ride part of the way home with Father & Mother. Lila went over to McKee's this morning to mind the kids. Bill & Ida drove over to Geordie's. I was sleeping this afternoon. Ern called for me this evening and we drove to Cargill Methodist Church. Fan and Lila got home from Pinkerton church when we got home. They got a ride to our place with Percy Mooney and then Fan went to the fourteenth with Ern. A very cold and windy day and a few flurries of snow. This is Ida's birthday. She is eleven years old. Mother & Father went to Cargill this afternoon and I was keeping house. Geordie Sawyer was over this afternoon. Alma & I walked over to Uncle Tom's this evening. The least bit warmer today. Father is ploughing for Bill Desmond today, Mother & I put out a monstrous old washing and then I scrubbed the kitchen floor, Mr. & Mrs. Deitweiler called here for a few minutes this afternoon. A nice warm day. Mother walked over to Geordie's this forenoon. I was keeping house. She came back this evening with Will when he was coming from McKee's. Daunt called this morning when he was going to Cargill. A nice day. I was down to Pinkerton this morning. Father sowed mangles this afternoon. A lovely morning but it turned cold before night. Ern Webb called for me this morning at eight o'clock and we drove to Chesley. Wilson & Kate, Fred McKee & Lizzie Watson, Jim Cruikshanks & Mabel Watson went also. We had dinner and supper at the McDonld House. We had an excellent time all day. We went to a concert at night in the Hall. It was splendid. It was after one o'clock when we got hone. It was very dusty driving and my eyes and mouth are full of dust. A little colder today with rain in the afternoon. My eyes are dusty this morning, at least they feel as if they are full of dust. I went to bed tonight as soon as I came in from milking and that was seven o'clock. A rainy day. I got up this morning at seven o'clock. Lila & I walked down to church and back again. Bess & Geordie left the two kids at our place and went to morning church and then came back and stayed till evening. Uncle Tom & Maggie and the two kids came over this afternoon. Jack Sawyer got his hand badly burned with hot grease at noon. It stopped raining when it was time to go to church and Fan & I called for Alma and we went to church. It poured rain all the way home, Wes Caswell, Johnny Reid, Alma, Fan and I came up together. Mr. Eckford of Southampton preached morning and evening. We did a considerable bit of laughing at both services. A cold and wet day with a few flurries of snow in the morning which ended with a heavy snow storm. Father & Mother went over to Uncle Tom's this afternoon for a little while. I went as far as the corner with them and then I went down to Geordie's. I was in at A.C. McKee's going down. A cold day. Geordie Mateer was over this forenoon. Bess & I are busy housecleaning. A warm day, Bess & I are busy housecleaning. I drove over this afternoon and Mother went back to help Bess white wash. I kept house at home. Dave Elphick was sowing grass seed. He was here for supper. Ellie Reid was in for a little while after school. Her & Lila were busy working questions. Mother drove back in the evening and brought Jack over for a drive. I took Jack back with me. Fan was down tonight. A warm day. Bess, Jack and the baby and myself drove over home this afternoon and then Bess & I drove to Cargill. We stayed for tea when we came back. Mrs. Sturgeon was over tonight. A warm day, Fan was down this evening. A warm day, Geordie cane home from Brant this afternoon, He s there all week. I walked home this evening. I was, oaking to Fan when I was coming home. A warm day. Ida & I walked down to Sunday School, I taught Johnny Reid's class in Sunday School. Johnny was absent. I went over to meet Fan this afternoon when she was coming from McKee's. Bill took Fan & I for a drive this afternoon. We went as far as Cargill station. When we got back the folks were all away. After supper Fan & I walked down to night church. Ern Webb drove Fan & I home. He drove Fan home first and then Ern & I went away up past Mutrie's for a drive. Ern gave me a souvenir pin of Chesley. A warm day. We finished planting potatoes this afternoon. Alma Reid came over this evening. We had a high old time. Fan came over this evening. I went over with Fan and stayed all night. Alma came as far as her place with us. A nice forenoon but a rainy afternoon. Geordie called at McKee's for Fan & I this morning at six o'clock and we drove to Paisley. It was raining when we were coming home. Geordie came home by the base line and we went into Geordie's and stayed for dinner. I walked home after dinner. Fan walked to McKee's. I walked down to Pinkerton this afternoon through the rain. Tom & Mrs. Sawyer and baby called here for a few minutes this evening. Fan & I got our shadows struck today. A very cold and rainy day. Mother & Father drove to Geordie's this afternoon. I was keeping house. A cool and windy day. Father & Tom Sawyer were drawing lumber for J.B. Campbell. He got his hand jammed. We washed and scrubbed and baked today. I walked this evening after tea. Nellie Campbell wheeled up here tonight for about half an hour. Fan came over tonight. Lila & I went as far as Uncle Adam's with her, then Lila stayed there and Alma and I went to the fourteenth corner. Willie Cruikshanks caught up to us and walked to the corner. He did a considerable bit of foolish talk and was very tiresome. Mr. John Russell was over this evening for a few minutes. A beautiful warm day. I was ironing all forenoon. Alma called for me this afternoon and we walked to Cargill the back way and came home the front way. Lila & I walked down to Guild this evening. I read Chapter 2 St. Luke, verses 41-52. Father was over at Daunt Metcalfe's shingling the barn. Bess, Mrs. Sturgeon and Jack & baby called this forenoon when they were going up to Sawyer's. A warm day. I did not go to Sunday School or Church. I walked over to A.C. McKee's after dinner and called for Fan and we walked up to Carr's and then went up to Purdy's Church. We did not go in to Sunday School but we went to Church. Mabel Stewart, Jack, Harry and Arthur Groves, and Jim Cruikshanks, Fan & I were at Carr's for tea. Ern called for me in the evening and we drove to Pinkerton Church. Bill Stewart called and took Fan & Mabel to church. The Foresters marched to our church tonight. Fan walked home with Vina McKee. Ern and I went up to Purdy's Church for a drive. It was a grand night. A warm but, windy day. Lizzie Watson was here nearly all forenoon. I walked up to Sam' s place with Father's dinner. I walked down to Pinkerton and back again. Nellie Campbell and I had quite a time with Mr. Desmond in the store. He is a little off. A warn but windy day. Geordie left Bess and the children here. While he went to Pinkerton. Alma came over this evening. Vina and Fan also came over. Lila, Alma & I went away over to the fourteenth corner with the girls when they were going home. We had loads of fun. A warm but windy day. Lila went to Pinkerton this evening. I took the wheel over to Fan. I met Vina at the twelfth corner when I was going. We called for Alma. Fan & Vina came back to the fouteenth bush with us when we were coming home. We had a good time. A warm but windy day. Bess and the children drove over this afternoon. Mother & Bess drove to Cargill. I stayed home and minded the children. I was over to Uncle Adam's for a few minutes after dinner. Ida went back with Bess to open the gates. Fan drove over to our place tonight. She was taking Sleepy-Joe down to Richardson's. I went down with her. We walked back home again and the Lila & I went past the fourteenth bush with Fan. A warm day. Mother & Father drove to Daunt Metcalfe's this afternoon. I kept house. Alma & I walked down to Guild and back again.There was a football match between Eden Grove and Pinkerton school boys. We went to the match first and then to Guild. I got an intoduction to Miss Nileans, Lilly Garland's cousin. A warm day. Fan walked over here tonight, amd we walked to Pinkerton to the football match between Eden Grove and Pinkerton seniors. Myrtle Reid called for Lila and they went to match also. Kate Cruikshanks, Fan & I chummed together. We had a good time. We were up to Gibb's for a while. Ern, Wilson, Kate & I went into the Ice Cream Parlor for a while. We went for a walk and then Ern drove Fan & I home. He drove Fan over to the fourteenth and then he dove me home. A very warm day. Mother, Father & Ida drove down to Jack's this morning. I got a ride to Sunday School with them. I came home after Sunday School. Bill went over to A.C. McKee's this morning and then Ern and him went up to Webbs for their dinner. After dinner Ern & Bill came over to our place. Fan got a ride from McKee's with them. Ern took Fan & I to Glammis Presbyterian Church. Another minister took McEachern's place, He was a good looking fellow but only said one word at a tine. We came home by the forteenth. A very warm day. Ern called for me this afternoon about three o'clock and we drove to Walkerton. Wilson & Kate followed us all the way. We had supper at the Queen's Hotel. We went to the exhibition grounds to see a football match between Owen Sound and Walkerton. The score was 2-1 in favor of Walkerton. Wilson and Ern think they have a good joke on Kate & I and I guess they have. We had a very good time. It was about twelve o'clock when we got home. A very hot day. We were very busy today. I feel a little tired and sleepy today. Geordie Sawyer came over for me tonight.. When we got back to Geordie's, Tom Sawyer, Fan & Vina McKee were there. A cool day with a little rain. Geordie went to J.J. Donnelly's mill this morning. I drove over home this afternoon. I gave Bess and baby and Mrs. Sturgeon a ride as far as A.C. McKee's. I brought Jack over home with me. Mother went to a quilting bee at A.C. McKee's and I stayed home and worked. I drove back this evening and called for Bess and the baby. Bill Stewart & Mabel were down this evening. A warm day. Geordie went to McKee's mill this morning with Ern Webb. Jack Sawyer was running away all day. We had to tie him up. Geordie Mateer was here working today. A warm day. Father & Ida were over today. Ida stayed and Father went home. I walked over home after dinner. I called in at McKee's for a while. Fan & I were talking for a while. Fan & I got weighed. Fan weighed 105 and I weigh 92. Bess, Ida and the two kids drove over in the evening. Bess & I drove down to Pinkerton. We met Geordie & Ern when we were going down. They were just getting home from Brant. Bess and I had two dishes of ice-cream and I wish I had never seen it, for it wasn't good and I am pretty near sick. Bob Wilson was here this evening for a few minutes. Lou & Daunt were here in the evening after I was in bed. A warm day with a cool breeze before evening. There was no church this morning. I slept nearly all forenoon. I got dressed up at twelve o'clock and walked over to the corner to meet Fan. We met Bill Stewart at the corner and got a ride to Daunt Metcalfe's. We went to Sunday School and Church. After church I went with Mabel to Stewart's. Ella Cruikshanks, Jack Groves, Billy Webb and Ern Webb also came and Bella & Amos and the baby came down. Mr. & Mrs. Joe Purdy came down in the evening, Ern & I left Stewarts after nine o'clock. We went up to Purdy's corner and then around home. Jim Cruikshanks was also there for tea. A warm day. We were very busy today. Fan came over this evening. Lila went over to Geordie's this evening. I went over a piece of the way with Fan when she was going. We met Lila and she came back with us. We were shot at twice and missed and had to put up with a good bit of screaming and groans. A very warm day with a thunderstorm at night. Father & I went to Pinkerton this morning. After dinner Lila, Father & I drove into Paisley. Lila is going to try the entrance. She is boarding at Watson's. I was at Watson's for tea. Rebecca Watson is there now. She is a nice girl. It was after eight o'clock when we left Paisley. We drove down to Geordie's and changed buggies. We were caught in a heavy thunderstorm and got wet. Bill took in the Model Farm at Guelph today. A cold north west wind. Father drove Mother to Metcalfe's this morning. I was keeping house all day. Bill went to Brant this morning. Mother came home tonight after I was in bed. A cold morning but warmer towards evening. I was over to Uncle Adam's this forenoon. Lou and Mr. & Mrs. Joe Purdy and Bertie McAfee went to Cargill and I gave Lou my coat. Alma had a crow to pick with me today. Ida went over to McKee's and Geordie's this evening after school. Geordie, Bess and children were over this evening. Fan was also over, Fan & I intended going to Pinkerton but did not go. A warm day. Father & Mother drove down to Pinkerton this morning. I got a letter. Father & I drove into Paisley this afternoon for Lila. We had our tea at Watson's. I got an introduction to Mrs. Welshford and Mrs. Erwin of Cargill. We got home about nine o'clock. Mr. & Mrs. George Moffat's baby was buried this forenoon. The other little fellow is very low. Lila & I walked down the road till we met the girls coming fron Guild. Alma went home with John and Lila & I walked to the fourteenth corner with Fan & Vina. A warm forenoon with rain in the afternoon. Mr. Pat Desmond came down this forenoon, was here for dinner and stayed the afternoon. We had quite a bit of fun with him. I went to bed at eight o'clock. Beaton Well's house was burned to the ground this morning at six o'clock. A warm day. I did not go to church or Sunday School this morning. Fan came over after dinner. Uncle Adam, Aunty and Annie May were over this afternoon. Fan & I went as far as Plum Creek bridge with Bill when he was going to Cargill. Fan & Lila went to night chlurah. I did not go. Daunt & Lou were here in the evening.